Aerial stem blight and root rot are caused by Phytophthora nicotianae and occasionally other species. Stem and branch blight frequently occurs without root rot, but root rot is involved in some cases. Dark brown to black lesions form on stems and branches, causing the portions above to wilt and die back. Symptoms of root rot include yellowing and scorching of leaves, poor growth and stunting of plants, wilting and death. Plants with root rot have reduced root systems and individual roots tend to slough off the outer tissue, leaving the inner core behind. Prevention & Treatment: Water management is the main preventative measure. Frequent watering, even in moderate to dry sites, can make things worse. 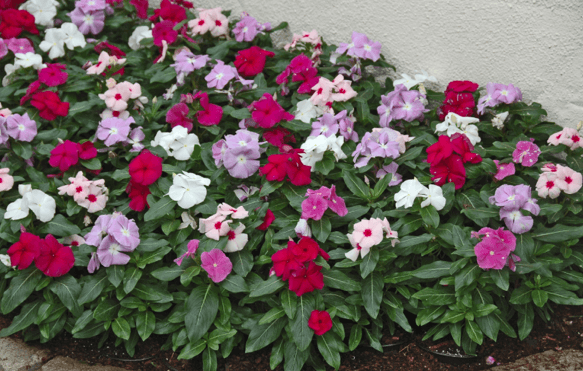 Annual vinca and Vinca species are fairly drought tolerant, so water only as needed. When rainfall is insufficient to supply an inch of water per week, apply deep supplemental irrigation once, or possibly twice per week, depending on soil type, exposure and weather conditions. Avoid excessive amounts of fertilizer as well. Plan of Action: Throughout the month of July, we will be removing infected plants as we see them. We will treat remaining plants with a fungicide if cultural practices are failing to prevent new infections from occurring. Please resist the urge to water these plants and if you have any questions, feel free to give us a call and we will be happy to discuss in detail this POA if necessary.